The Maestro and I took the girls to see Inside Out as soon as it was out in the theatres. Sophia actually saw it twice in one day because she was invited to go with a friend, and we went a couple hours afterward on a whim. Because Sophia had already seen it, she sometimes couldn't help warning me about things coming up or telling me she knew she was going to cry at certain parts. Luckily, she was sitting at the end of the row, right next to me, and I didn't mind. Her sisters may have let their anger and disgust emotions come out a little bit if they had heard her whispers. They are definitely not fans of movie spoilers! I loved the movie--we ALL loved the movie. I found myself completely drawn into Joy's quest to keep Riley happy despite all of the upheaval in her life. I found myself upset that Sadness was getting a little too involved. I found myself laughing at the antics of the other three feelings as they desperately tried to fix things without Joy at the helm. It was just so well done. And then came Bing Bong. Sophia leaned over and quietly told me that she would be crying a lot soon. And then she said something that, as it turns out, is the most important lesson the movie could teach. "Sadness is really important in this part. She's really important in the whole movie, actually." I watched as Joy desperately tried to get Bing Bong to stop crying. As a parent, I recognized her tactics as she worked to convince him that what they were doing was so much fun. And to remember the fun times. And to be happy and stop crying already! But her tactics didn't work. And that's when Sadness sat down next to him and asked him why he was sad. She told him that she knew how he felt and they talked about his sad feelings for a while. And then he was fine. He stood up, stopped crying, and was ready to finish what they'd started. Joy couldn't make Bing Bong happy, but Sadness somehow could. Later in the movie, we see several other instances where Sadness was actually the catalyst for Riley's happiness--not Joy. And, ultimately, it is Sadness who saves Riley. As a mom, too often I am like Joy--insisting that my children be happy and treating Sadness (or Fear or Disgust or even Anger) as something negative. Something that they shouldn't be feeling. Something that I have to fix for them somehow. But I'm wrong! It's okay to be sad. It's okay to feel those "negative" emotions. Sadness helps us to recognize the happiness more readily, but more importantly, it helps us to develop empathy. Sadness was able to help Bing Bong because she showed him empathy. Joy couldn't show Bing Bong that empathy. She simply didn't understand why he was crying at all. In fact, Joy's inability to understand how Sadness could make Riley a more understanding and empathetic person led to all the craziness in the first place. She could not allow a core memory be a sad one, and by trying to eradicate Sadness--to keep her in her little circle--she actually erased all of the happy core memories right along with the sad one. I came away from this movie realizing that I can do better as a mother. It's okay to let my girls be sad sometimes. Instead of trying to cheer them up, maybe I should listen to them tell me why they are feeling upset. Maybe I could dig down into my own core memories--not all of which are happy--and tell them about a time I felt similar emotions. And just maybe I can use their own experiences to help them learn to show empathy and kindness to others when they are unhappy. Sophia was right. Sadness did play an important role in the movie. And it plays an important role in our lives, too. 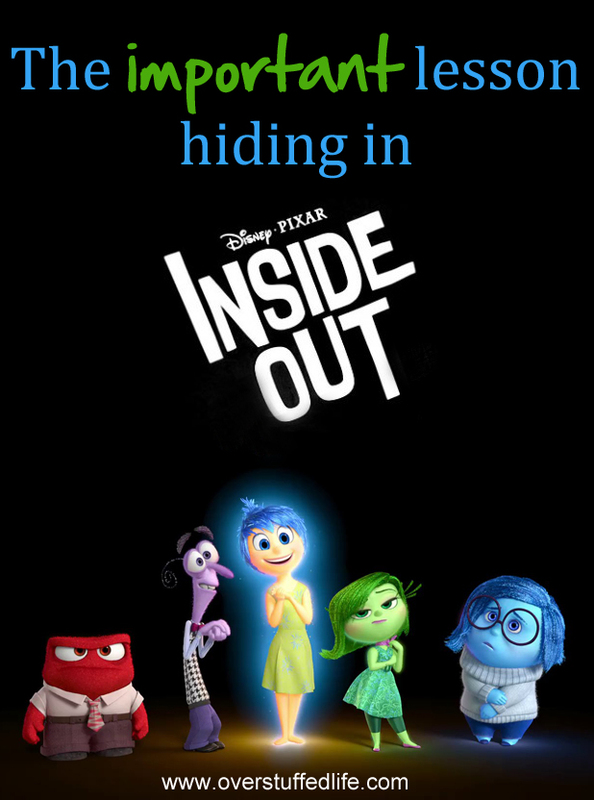 I saw Inside Out and you are spot on. Denying sadness is dangerous. No one can be happy all the time, and in recognizing and allowing sadness, you are allowing joy to return. I took the grands to see it. The 4 yr old got a little distracted close to the end, but surprisingly he recounted all the details to his parents. I've seen other reviews like yours. But I gotta tell ya, I can't make sense of them. I think I need to see this move to understand what everyone is talking about. I love the movie! I loved the idea that sadness isn't a 'bad' emotion, but an important one. Without sadness, Joy becomes meaningless.. and sometimes the things that make us scared, and sad and lonely aren't tangible THINGS. They aren't monsters or bad guys.. sometimes we are just sad for no reason, and that is okay. You have the right to feel however you feel.. it doesn't make it wrong. I was going to wait to read this until after I read the movie, but I decided to read it anyway. I'm glad I did. I love what you said about sadness. I need to take more time to listen to my kids instead of trying to fix them when they are sad or mad! I loved this!!! I loved the movie and I loved what I learned from it. Thanks for this great post! I am going to share it on my Facebook tomorrow! Thanks for this review Lara. I've actually been on the fence about this movie so it's great to know that it is worthwhile and teaches a great lesson. Thanks! I have definitely caught myself a lot in the last two weeks. It's a big paradigm shift for me as a mom. I'm so thankful I was touched by this idea while watching this movie!